Parish life centers in the Solemn Mass at 10:00 every Sunday morning. A simpler Low Mass is celebrated at 8 a.m. on Sundays. Christian Education adults is offered from 9:00 to 9:45 a.m. 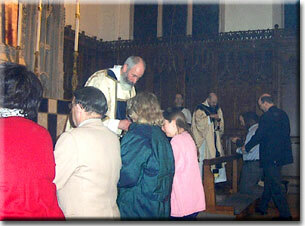 The children of the Sunday School worship with the congregation during the Solemn Mass until just after the Gospel. Before the Sermon, the Sunday School students and teachers leave for the Children's Worship Center during the last verses of the Gospel Hymn. They join the Solemn Mass again for Communion and then return to the Worship Center until the end of the mass. The congregation is gathered from Boston and communities of the South Shore. Approximately half of those worshipping here live within five miles of the church; while others come from as far away as twenty-five miles. Those who worship here include both Episcopalians and other baptized Christians who find the faith and worship of this Christian community meaningful, as well as those seeking to find a place to experience God's presence. Communication in the parish is by announcements contained in the Sunday bulletin, through The Chronicle, a newsletter published eight times a year, and through this website. The best way to keep informed is to be in church Sunday by Sunday, which is, of course, a basic responsibility of a serious Christian. Much parish business is accomplished at coffee hour, so if you want to become part of the parish family, come to Peabody Hall for some refreshment after the Mass.